InMunich Tours - Free Tour, Dachau & Private Tours. InMunich Tours - Your Friends in Munich"
We are pleased to announce that for the fourth year running we have been awarded the Tripadvisor Certificate of Excellence. 2015, 2016, 2017 and now 2018! Come with InMunich Tours and let us show you the absolute best of this incredible city. Local, experienced and highly rated guides with years of guiding experience and a real passion for story telling show you around the city they know and love! The Wittelsbach Bavarian Royal Family, the Monks and their Monasteries, and the world's most famous Beer Halls are just some of the treasures waiting to be uncovered. Munich's 858 year history is amazing and diverse. 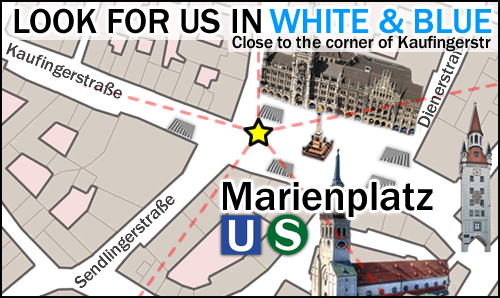 We offer a Free Tour of Munich and a Dachau Tour in the English language every day starting at 10:40am at the Marienplatz. We also have a range of very competitively priced Private Tours catered not just for larger tour groups, but for small groups & even indivduals who are looking for a much more personalised & intimate experience. Through years of travel experience, our very own guides have developed a good sense of what it is like to explore a new city. We always wanted to know the same things; What should we visit? How do we get around the city? And most importantly - Where must we eat & drink?! We can answer all of these questions and a whole lot more. As guides living in the city for many years we know how to maximise your time, your experience, and give you the absolute best of what Munich has to offer. Not only are we your guides and historians, we are your friends in Munich!